I’m thrilled to be able to share my business story with more people through The Woman’s Advantage. To see my article click here- Kucki and The Woman’s Advantage. Tell me what you think! I’d love you to share with your network too and all the amazing business woman, dreamers and believers out there! Live your dreams, the sky is the limit! Bravo Cathay pacific for expanding their “I can fly’ program. Headquartered in Hong Kong, Cathay Pacific Airways is one of the world’s leading passenger and cargo airlines, serving more than one million passengers a month to Asia, Europe and North America. The first I Can Fly Program was launched in January 2003 in Hong Kong. Over 3,700 Hong Kong students have graduated from the program. To apply you need a passion in aviation something we at Kuckico are thrilled to hear. Passion to dream big and go after your goals in life are the cornerstone of our beliefs and we love that Cathay Pacific are giving these students the insight into an incredible opportunity and potential career in aviation. Due to its success, Cathay Pacific is pleased to announce I Can Fly Canada – Vancouver Spring 2017 program. A program that offers Grade 11 high school students the opportunity to step behind the scenes of commercial aviation and explore various careers in this exciting industry. We provide an 7-week Academy that meets once a week to help students explore various careers in aviation. Through a series of field trips, lectures and hands-on exercises, participants will learn everything about aviation from engineering to passenger sales, and even meet real pilots and flight attendants. The program is provided free of charge to Grade 11 high school students in the Greater Vancouver Area. Applications are being accepted now. Visit www.cathaypacific.ca/icanfly for more details. Please feel free to forward this email to a Grade 11 high school student you may know. On International Women’s Day this year we honour the female pioneers of aviation who have flown through the glass ceiling. Back in 1909 Florence Taylor became the first woman in Australia to navigate a heavier-than-air craft. 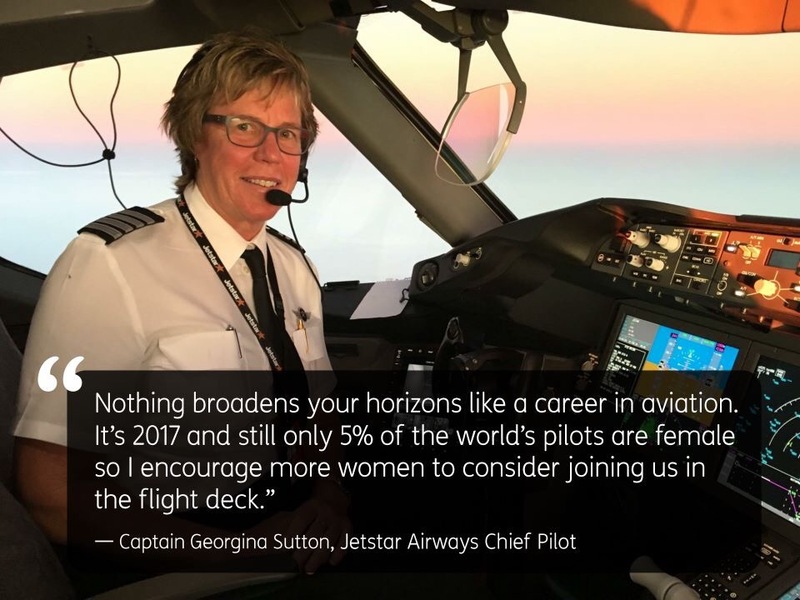 Fast-forward to 2015 and Jetstar Airways appointed Captain Georgina Sutton as the first female Chief Pilot in the southern hemisphere, and only the second in the world. To all the women in aviation and their supporters, we salute you. We mourn a fellow daughter of the sky. With great admiration for Yu Xu and with sadness we mourn the tragic accident that ended her life and a career she loved. We would like to extend our condolences to her family and her co-pilot. She choose a career that made her heart sing and her legacy and inspiration will live on. China is mourning the death of Yu Xu, the country’s first female J-10 jet pilot who was killed during an aerobatic training session on Saturday. Ms Yu was hit by the wing of another aircraft after ejecting from her plane, Chinese media reported. The domestically made jet crashed into a field in Tangshan, Hebei province. “We have lost a comrade and the air force feels great pain and sadness for Yu Xu’s sacrifice,” air force spokesman Shen Jinke said. According to reports, Ms Yu was forced to eject from her plane after it collided with another. Another pilot, 35, survived the crash. He is said to have been her co-pilot and has already been discharged from hospital, the Beijing News reported. The black box and the engine of the aircraft have been retrieved and an investigation is underway. An interview, Lines from the La-Z-Boy with Kucki Low, South Africa’s first commercial airline pilot. Kucki – “I had so much fun this week being interviewed for the ‘Lines from the La-Z-Boy feature’ below is a copy of the interview as seen on the fabulous blogger site Literallylife, its worth taking a look for some really fun articles, Nikki was recently nominated as a top blogger in Vancouver by Vancouvermom“. Kucki and Sibongile met in 2011 when they were both speakers at the ” Leadership Development in Aviation Africa” in Johannesburg South Africa. At the time they were both fairly new to public speaking but Kucki was really touched by the honesty in sharing her story. Her determination and passion not only for aviation but for wanting to make a difference in Africa was very apparent. Click the follow button and enter your email to join the journey with Kucki and the Kucki crew on the trip to the red carpet and beyond. Enter your email address and join Kucki by following this blog and to hear the latest in the journey to the premier and making dreams come true.